Blast new energy into your Dust Tactics experience with this new walker expansions for Dust Tactics, the Light Panzer Walker. 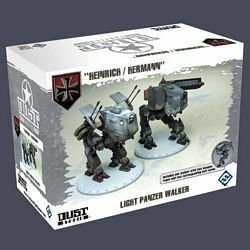 Axis players will want to expand their armies to include the new Axis Light Panzer Walker, whose body can be customized to either Heinrich or Hermann, both offering advantages for any Axis general to bring onto the battlefield. With one of the most deadly weapon systems seen since the beginning of the war Heinrich can crush an entire squad with its four powerful cannons and engage enemies from a great distance. The Axis’ newest light footed anti-tank robot, Hermann, has a revolutionary laser cannon. Find Hermann a secure position and use its sustained fire to waste any Allied armored unit.